With the help of Wu Bei (吴蓓), a teacher at Beijing Steel and Iron College who also witnessed the Liubukou massacre, I settled in Hainan and worked for the real estate company run by Ms. Wu’s husband. After a while, I opened a small convenience shop on the premises of the residential development where I lived. In Hainan, I continued to train myself. In 1993, Hainan’s Disabled Persons’ Federation took me to two national tryout competitions that selected athletes to attend the Far East and South Pacific Games for the Disabled in September, 1994, in Beijing. I was chosen. In May 1994, the China Disabled Persons’ Federation (CDPF) organized training in Beijing for all the athletes who would be representing China, and it so happened that trainings for his events were held at my alma mater. Needless to say, I was excited about the opportunity to win for China and for myself. I trained very hard. The staffers and the coaches knew how I lost my legs, and they mentioned that the CDPF was discussing whether to allow me to attend the games, but all in all, everything else went normally. One day toward the end of May, Jia Yong (贾勇), a CDPF official who oversaw the training camp and who is currently the executive deputy chairman of China’s Paralympic Committee and deputy chairman of the Asian Paralympic Committee, and a coach came to look for me. They took me into the hall on the first floor of the college’s administration building, a place I was very familiar with during my student years. Lots of people were standing around, and I saw a few people lifting and moving the Chairman of the CDPF into the hall. He was Deng Pufang (邓朴方), Deng Xiaoping’s wheelchair-bound son who was paralyzed when he had jumped out of a window in Peking University during the Cultural Revolution to escape “rebels” pursuing him for being the son of one of the biggest capitalist roaders. 3) If you win medals you will be requested for interview by the media. We hope you avoid media; if it really cannot be avoided, do not talk about the circumstances in which you were injured. Make up something else, like a car accident. Anything. “That’s great,” they chorused. Deng Pufang was on the scene, but no, he didn’t talk to me. After the conversation, they even took me with them to watch a show in the auditorium by some singers and other entertainment celebrities. I was relieved, because now that things were laid bare, I could focus on training and not worry about it anymore. Fang Zheng in college. Click to enlarge. It was around 10 o’clock in the morning, and they told me that they had bought plane tickets for me and the Hainan chairman and we were to leave right then for the airport to catch the flight around noon. They backed down but they didn’t allow me to go back to the training camp again. That evening I went to meet teacher Ding Zilin (丁子霖), the founder of “Tian’anmen Mothers.” We had been in contact since 1992 but I had never met her. I thought if I didn’t take that opportunity, I didn’t know when I would have a chance to meet her. When I arrived at teacher Ding’s home at Renmin University of China (中国人民大学), a great number of plainclothes cops were loitering outside her apartment building. I had dinner with her, and left around nine o’clock. She walked me across the campus to see me off. All around us, plainclothes cops followed and watched us. It was at once infuriating and ridiculous. At one point, teacher Ding confronted them, asking why the government was so uneasy about an old lady and a man without legs. Fang Zheng and Zhang Qianjin in front of his shop. and to compete in the international games, you have to be selected by the state. Outside the system, you cannot take part in sports competitions as an individual. In Hainan, I had been living with my girlfriend. I met her during the Chinese New Year holidays in 1989 in my hometown Hefei. She came to the hospital to be with me two days after I was hurt. Starting in 1993, Hainan’s real estate bubble burst, she was thinking about going abroad, so she went back to Hefei to obtain a passport. But the local public security told her that she would not be given a passport because of her relationship with me. This was something neither she nor I had expected. She became desperate about the future. In early 1995, she left me. For all those years, for all the hardship she had to endure and the sacrifices she had to make, she didn’t leave me. But in the end, she had to give up because the state power did not like it. After the 1989 movement, many students went to jail, more were booted out of the system without a job or unable to maintain one because of lasting and systematic interference from the government. In the 1990s, Hainan had become a destination for many 1989ers, including Zhang Qianjin (张前进), Wang Dan (王丹), Kong Xianfeng (孔显峰), Lu Jiangtai (吕江台), Zheng Xuguang (郑旭光)，Zhou Fengsuo (周锋锁), where, far away from Beijing, they tried to find luck and make a living, or even make money, in the new economic zone. My place became a hub for many of these friends. In May 1995, also the international tolerance year, we worked on a signature campaign calling for the release of political prisoners and to redress the Tiananmen movement as its 6th anniversary approached. Another thing we were working on was a report about the custody and repatriation policies in Hainan arising from a young adolescent I had helped. One day a boy walked down the street towards my store. Thin as a skeleton and pale, he was about to collapse at any time. He begged for food at the store; I gave him food and kept him. He was seventeen years old and had come to Hainan to look for his older sister from Zhejiang. Being a minor, he didn’t have an ID and was picked up by the custody and repatriation enforcement. In Hainan, you had to have an ID card (身份证), a temporary residential permit (暂住证) issued by the Hainan authorities, a migrant worker permit (外出打工证) issued by your home town authorities, a Border Permit (边防证) and, if you were a woman, a marriage and reproduction certificate (婚育证) to be legally staying in Hainan. Police frequently conducted raids and pulled people off the street and put them into iron-barred trucks. If you paid money, they would let you go, or they would send you to work on road or other kinds of construction sites in Guangdong or Hainan. The young man was kept in the custody center for a month or so and was let go probably because he had become so weak that he might die there. My friends and I were enraged, Lu Jiangtai in particular who was a college student during 1989 in Hunan. Lu went to the authorities to complain, collected information, and wrote a report to be distributed to human rights groups overseas and to be filed at a court. Fang Zheng in front of his apartment in Hainan in 1994. In late May, perhaps in the evening of May 26th, we got both the appeal letter and the report typed and printed, ready to be sent the next day. We chatted and stayed up late. In the early morning, still asleep, a swarm of policemen and armed police raided us. The other half of our group, staying with another friend, was also raided at the same time. 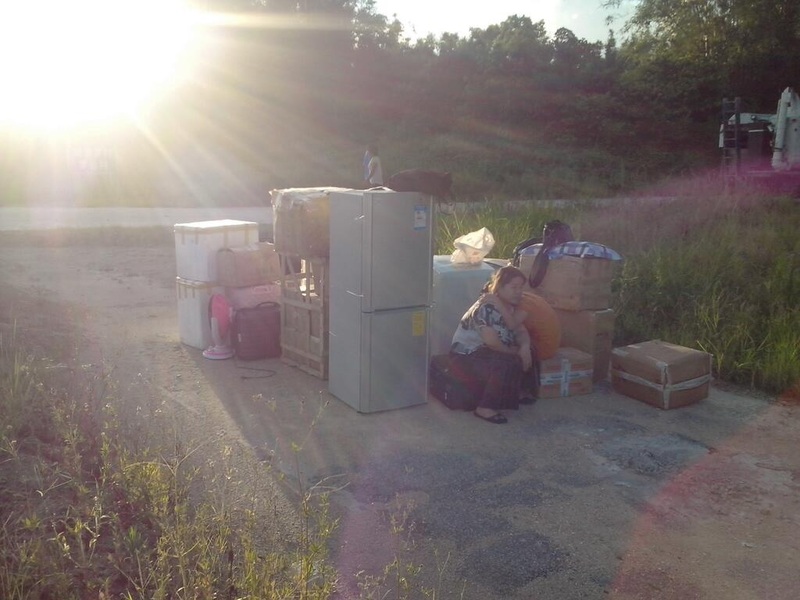 The police confiscated all of our materials and took all of us, including my younger sister, to the detention center. 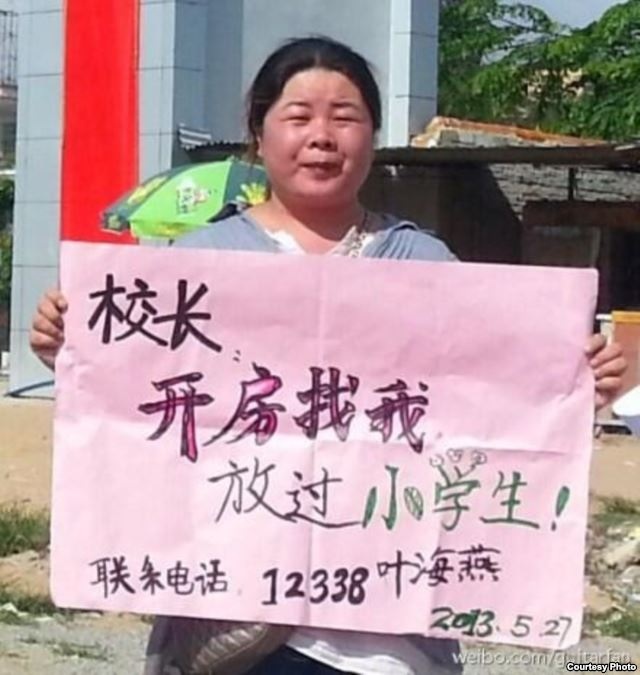 My sister and I were released after one day; Zheng Xuguang and his wife were detained for a month before being sent back to their home province, Shaanxi. Lu Jiangtai was indicted and sentenced to five years in prison for authoring the report about custody and repatriation policies that weren’t abolished by the State Council until 2003. It was my first encounter with the police in Hainan. They had probably been watching me all along for all those years, but I just didn’t know. I went to visit Lu Jiangtai once in the detention center. Then they barred me from visiting him again. After he was sentenced, they sent him away to I don’t know where. I have never heard from him again, nor do I know his whereabouts now. As Hainan slumped into a depression, people who had come to look for jobs, opportunities and fortune took leave. My store had fewer and fewer customers, the road construction around it made it worse, so I finally closed it down. After that I partnered with friends and had a small tourism business that sustained us just barely. By 1997 and 1998, most of my friends in Hainan had left. I felt lonely and life became harder. Friends in Beijing urged me to go back as well where, they said, economic development was taking steam and it would easier for them to lend me a hand. On the evening of March 7, 1999, without much planning and without telling anyone, I got into a taxi and went to Xiuying Pier in Haikou (海口秀英码头). Quietly I boarded a cross-channel ferry and arrived in Zhanjiang (湛江), Guangdong, the next morning. To be continued: Fang Zheng meeting his future wife, his unexpected brush with the 2008 Olympics, and leaving China. July 6, 2013 10:27 pm / 6 Comments on Help Ye Haiyan!